The internet has been one of the biggest innovations of our modern world. It has not just made life more convenient, it has also kept families, friends and loved ones connected. Nothing is infallible though, so even this advanced technology experiences major problems. A lot of people depend so much on the internet that when it crashes, they go berserk. Wireless connection technology is a convenient way to access the internet. This feature is excellent for laptops. You don’t need an ethernet cable connected to the modem and laptop anymore. With wireless connection, you can bring your laptop to a different location, as long as your computer is within reach of your wireless router. In this article, I will give you some information on how to troubleshoot your wireless connection. However, you need to make sure that your internet connection is working. Meaning to say that at least you can connect to the internet hard wired. Hard wired means the computer is connected directly to your modem through an ethernet cable. If you can connect to the internet hard wired, we can narrow down your internet problems. If you are using Windows XP, right-click on your wireless connection icon located on the right-hand corner of your screen. Then click on repair. It should automatically fix your wireless connection. You can also locate the wireless connection settings by clicking on start > control panel (switch to classic view) > network connections > right-click on wireless network connection > click properties > click repair. You can try to rebuild your wireless connection if the repair option won’t work. Rebuild means removing the wireless connection profile and then creating a new one. It is possible that your wireless connection profile was corrupted. Before doing this step, take note of your wireless connection password as you will need that later on. To rebuild your wireless connection, click on start > control panel > network connections > right-click on “wireless connection” icon > click on “properties” > click “wireless networks” tab > under “preferred networks” click on your wireless connection profile > click remove > click OK.
After removing the wireless connection profile, you should go back to “network connections” > right-click on “wireless network connection” > click on “view available wireless networks” > click “refresh” on the left-hand top > click on your wireless connection profile then click on “Connect”. Type the WEP key if needed. If you don’t know your WEP key, try to access the router settings. The settings depend on the brand of your wireless router. Find the instruction manual for additional information. You can also try resetting the router if you have no idea what the WEP key is. This method will allow you to re-configure the router settings. Make sure that you have the instructional manual for the step-by-step configuration of the router, if not you can just Google the steps needed. If you find all of this too complicated, try to contact the manufacturer of your router for further assistance. 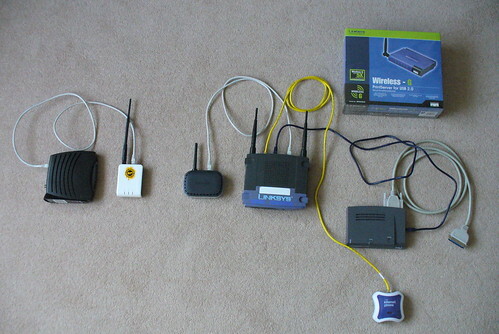 DQSupport can help you any Wireless Networking issues you have, and can get you setup in not time flat. Contact us today for our help!